In the field of medicine, 3-D printers offer a promising approach to the creation of customized dental implants. This study evaluated the extent to which 3-D printed devices are equivalent to traditional molded scaffolds, which are already FDA-approved products. Polylactic acid (PLA), an effective material for cell scaffolds and one of the most popular filaments used in commercial 3-D printers, was used to create the scaffolds. Scanning Electron Microscope (SEM) showed significant differences in surface topography between 3-D printed and spuncast (ideal molded) scaffolds. Surprisingly, differences were also observed between scaffolds produced by different 3-D printers. When dental pulp stem cells (DPSCs) were plated onto 3-D printed and spuncast surfaces, it was found that there were significant differences in attachment, morphology, proliferation, and expression of extracellular matrix proteins, indicating that the cells underwent differentiation. The 3-D printers created scaffolds that induced higher levels of differentiation, but maintained similar level of proliferation compared to those of spuncast scaffolds. These findings are of great importance in respect to the applications of 3-D printed devices for tissue regeneration. Currently, there is an increased demand for dental implants that are cost-efficient and tailored to specific patients. Problems with current applications of implants include: high production cost, potential transplant rejection of bone grafts in dental surgeries, and post-surgical irritation . Recent advances in 3-D printing will allow for quickly produced, customized scaffolds that could replace current methods of implant structure preparation. Specifically, this study focuses on the use of dental pulp stem cells (DPSCs) in conjunction with 3-D printers. DPSCs are very promising for tissue and bone regeneration. Naturally they differentiate into odontoblasts, which are responsible for growth in teeth and regeneration after structural damage to teeth. In addition, their potential for regeneration outside of the tooth is vast because they are multipotent, capable of differentiating in vitro into osteocytes, adipocytes, and chondrocytes, and are more easily accessible compared to other types of stem cells. DPSCs have a very low morbidity rate and their interaction with biomaterials gives them the versatility to reconstruct different tissue and graft allogenic tissue[1,4]. DPSCs also avoids many ethical violations that other stem cells, such as embryonic stem cells, may raise. For instance, DPSCs are often taken from wisdom teeth waste tissue, rather than from live organisms. This easy management makes DPSCs an ideal candidate for use in clinical trials on human patients. Dexamethasone, also known as a glucocorticoid, is an inexpensive drug that is normally used by previous studies to induce formation of nodules, which is an early sign of differentiation[4,5]. So far, external protocols for plating DPSCs only includes dexamethasone. This study investigates DPSC proliferation and differentiation without dexamethasone treatment. In this study, polylactic acid (PLA) was chosen to be the material for 3-D printing. PLA is a biodegradable polymer that has been approved by the Food and Drug Administration (FDA) for medical applications[6,7]. Previous studies have indicated that PLA is a viable non-toxic polymer for 3-D printing structures. 3-D printers are widely used in engineering to rapidly produce 3-dimensional structures. It uses additive processes by programming the computer to position thin layers of material, which ultimately builds up to create a design. Currently, molded scaffolds, or compressed and flat structures, are approved by the FDA for medical applications, specifically for dental implants. Studies have shown that DPSCs proliferate and differentiate efficiently when grown on molded scaffolds. However, recently, the field of 3-D printers has been expanding rapidly in the medical field due to its high potential for customization, personalization, and cost-effectiveness[11,12]. As a result, the FDA has been discussing for approval of 3-D printers in medical applications through 510(k), a form of premarket approval. 510(k) is an easy way for new devices to receive market approval by providing evidence that the device is substantially equivalent to an already legally marketed device. Through 510(k), it is not necessary to go through the long process of getting FDA approval. One problem is that although there has been a push for 510(k) approval to 3-D printed PLA scaffolds for culturing stem cells, there is no data to support the idea that 3-D printed PLA scaffolds are substantially equivalent to molded and spuncast scaffolds. Spuncast scaffolds are structures that represent “ideal” molded because the surface is created by spinning silicon wafers at high velocities while there are drops of solution on top, resulting in perfect distribution of the solution across the surface. The surface topography of 3-D printed PLA structures is unknown and has potential to have nanoscale and microscale patterns. It has been shown in previous research that surface roughness could influence proliferation and differentiation of DPSCs[15,16,17]. The effects of these patterns are still not clear, making the validity of 510(k) approval blurred. Coupling the proliferation and differentiation capability of DPSCs and the promising potential of 3-D printers, there could be a suitable alternative to current implants. This study provided the first set of data for assessing 510(k) approval of 3-D printers in the context of stem cell response. This was achieved by assessing reproducibility of 3-D printed structures, or comparing the effect of scaffolds created by two different printers on DPSCs. Then, proliferation and differentiation of DPSCs on 3-D prints were compared to those on spuncast scaffolds in order to assess the viability of 3-D printed devices as an alternative to molded devices. This multi-step study provided important insight into the capabilities of 3-D printers. First, it was hypothesized that different 3-D printers would produce different surface topographies. It was also hypothesized that the 3-D printed PLA scaffolds would have higher rates of proliferation, larger amounts of biomineralization, and stronger signs of osteogenic differentiation in comparison to those of the spuncast scaffolds. This hypothesis was based on findings of previous studies, which have shown that micropatterns and nanopatterns increase osteogenic differentiation in cells. DPSCs were taken from mandibular wisdom teeth waste tissue which had been cryopreserved before experimentation. AV3-eGFP, the cell-line used in this study, was provided by the Stony Brook University School of Dental Medicine. Previous studies done by Grottkau et al. indicated that green fluorescent proteins do not affect differentiation capability of DPSCs. In order to easily track cell growth, DPSCs were genetically modified to express enhanced green fluorescent protein (eGFP). All cell work in the lab was done in a Class II biosafety cabinet. DPSCs were cultured in T-75 flask until 70-80% confluence, washed twice with 10 mL of Dulbecco’s Phosphate Buffered Saline (DPBS; Gibco). The cells were then detached by trypsinization using 3 mL of 0.01% solution of trypsin/EDTA (Gibco) and incubated at 20% oxygen, 5% carbon dioxide, and 37oC for 5 minutes. Cell suspension was neutralized with 3 ml α- MEM, a media containing: 10% fetal bovine serum and 200 mM ascorbic acid (Basic media). Cell count was determined by using a Bright-Line hemacytometer and collected cells were suspended in the same media. Cell count would be used to determine number of cells that were plated and the efficiency of adhesion on surfaces. This cell culture solution was used to plate for the experiments. In order to study conserved properties of 3-D printers, two different 3-D printers were compared: MakerBot ReplicatorTM 2 Desktop 3-D Printer (230P) and MakerBot ReplicatorTM Desktop 3-D Printer (215P). The main difference between the printers was that the extrusion temperature of 230P was at 230oC and 215P was at 215oC. A specific scaffold was designed to be 10 mm width x 30 mm length x 2 mm height. This rectangular design was used in the study to compare the two printers and to compare 3-D prints to spuncast scaffolds. In previously conducted experiments (Kuan-che Feng, et al. ; unpublished), 3-D printed scaffolds with 10% infill and standard resolution of printing have shown better levels of biomineralization than 100% infill and high resolution printing properties. Since this study focused on proliferation and differentiation levels of DPSCs, 10% infill and standard resolution were used to synthesize all 3-D printed scaffolds. 15 samples of the rectangular design (10 mm width x 30 mm length x 2 mm height) were printed for each printer using PLA. Samples from each printer were then sterilized using ethylene oxide treatment by Stony Brook University School of Dental Medicine[19,20]. One sample from each printer was cleaned using DPBS wash, fixed with 10% formaldehyde, and vacuum dried. They were imaged using a Scanning Electron Microscope (SEM) and composition of the surface was analyzed using Electron-Dispersive X-Ray Spectrometer (EDAX; SEM and EDAX performed on a LEO 1550 electron microscope, Zeiss, Germany). This allowed for further analysis on the surface characteristics of the structures. In order to assess proliferation and differentiation rates of DPSCs on scaffolds of different printers, all samples were plated with 4 mL of DPSC culture (12,000 cells/mL as counted by using a Bright-Line hemacytometer). Media was changed and cells were imaged on a fluorescent microscope (Olympus CK40; cells light up green by eGFP) every other day, starting with day 1. Using the 230P, 20 samples of the same rectangular 3-D prints were printed. Spuncast samples were made by using a photoresist spinner (1-­PM101D-­R485) to coat the surface of a 200 μm thick, 1-0-0 orientation silicon wafers (Wafer World Co.) with PLA solution (30 mg/ml). The silicon wafers were cleaned using a RCA standard clean as outlined by Kern after a rinse in deionized water. All surfaces were sterilized using ethylene oxide treatment, which was done by Stony Brook University School of Dental Medicine[19,20]. The surface topography of the two sample types (3-D printed design and spuncast) were imaged and studied using a LEO 1550 electron microscope for SEM and EDAX prior to plating cells. All 40 samples were plated with 4 mL of DPSC culture (9,000 cells/ml as counted by using a Bright-Line hemacytometer). On day 3 of culture growth, media was replaced with the original α-MEM solution (10% fetal bovine serum, 200 mM ascorbic acid, and 10 mM β-glycerol phosphate) for half of the samples from all pattern types. The other half received an α-MEM solution with 10 nM dexamethasone (induction media). This set a control to assess how well DPSCs proliferated and differentiated without dexamethasone. Media was replaced every other day for all samples with its respective solution (without dexamethasone or with dexamethasone). Furthermore, to simulate an in vivo fluid motion, half of the samples from each pattern type were incubated on a rocking shaker starting on day 5, at 6 oscillations per minute. Every other day starting with day 1, fluorescent microscope (Olympus CK40) was used to image and monitor proliferation and early signs of differentiation (nodule formation). Table 1. The primers used for RT-PCR. Figure 1. SEM images of 230P and 215P. A) The 230P pictures show the fused filaments of PLA with higher magnifications for the rough and smooth areas. B) The 215P pictures show the unfused filaments of PLA with higher magnification for the rough and smooth areas. These results indicate that compared to 230P, 215P create incomplete surfaces that most likely resulted from the difference in extrusion temperature. The 215P was not hot enough to properly fuse together the PLA filaments. On day 21 and day 39, NucBlue Live Cell Stain (Molecular Probes) was used on the nuclei of the cells and xylenol orange orange dye was used to stain for calcium phos-phate deposition. The cells were imaged on a confocal microscope (Leica). To evaluate the differentiation level of cells grown on 3-D and spuncast scaffolds the expression of extracellular matrix proteins expression was analyzed by real time polymerase chain reaction method (RT-PCR). Cells were lysed with TRIzol (QIAGEN) and purified with QIAGEN RNeasy Mini Kit. cDNA was synthesized with reverse transcriptase, and the PCR was performed on Opticon PCR apparatus. RT-PCR reactions were performed for four proteins - alkaline phosphatase (ALP), osteocalcin (OCN), runt-related transcription factors (RUNX2), and alpha-1 type 1 collagen (COL1 a1) - since their expression would be increased if the DPSCs underwent osteogenic differentiation. ALP is known to be reliable marker for early detection of osteogenic differentiation. OCN is commonly used as a late marker to indicate osteogenic differentiation. RUNX2 is a transcription factor associated with osteoblast differentiation[26,27]. Lastly, COL1 a1 is a protein highly expressed in cartilage, bones and dentin. 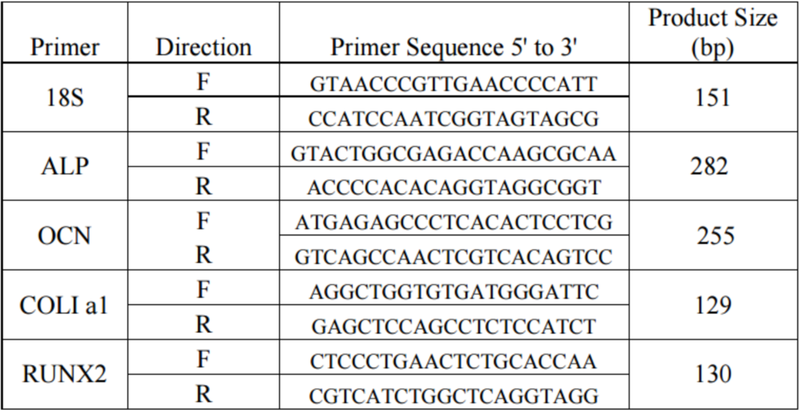 The primers used for the RT-PCR are shown in Table 1. For the reference gene, 18S RNA was used and all data for mRNA were calculated on base AV3 DPSC lysates at day 1, and present as relative amounts. SEM was used to look at the surface topography of the scaffolds. The SEM images showed that the scaffolds printed by the 215P printer were of a lower quality, containing many visible holes (Figure 1). These holes exist most likely because extrusion temperature was lower for 215P than for 230P, preventing proper fusing of PLA filaments as it was being printed. On the other hand, 230P printer showed a much more fused pattern that did not contain holes at all. The 215P printer and the 230P printer had similar levels of roughness throughout the print (Figure 1). The SEM pictures show significant differences in surface topography between two printers. Figure 2. Fluorescent images of 230P and 215P scaffolds with DPSCs on day 1. A) The 230P picture shows the cell adhesion for the 230P scaffold 24 hours after the initial plating of the DPSCs. B) The 215P pict ure shows the cell adhesion for the 215P scaffold 24 hours after the initial plating of DPSCs. The initial plating concentration is relatively the same. Figure 3. Fluorescent images of 230P and 215P. A) 230P has more nodule formation and number of cells. B) 215P has less prominent nodule formation and a fewer number of cells. The cell adhesion after 24 hours for the 230P scaffold and the 215P scaffold show that the 230P scaffold has greater cell adhesion 24 hours in (Figure 2). Based on fluorescent images, the 230P 3-D printed scaffolds had increased nodule formation and proliferation in comparison to the 215P (Figure 3). There was also a significant increase in concentration of cells for the 230P than the 215P (Figure 3). Figure 4. SEM and EDAX for 230P scaffolds. The upper-most picture shows an SEM picture of biomineralization on the 230P scaffold at 28 days at 10,000 times magnification. The EDAX confirms the presence of calcium phosphate. The confocal shows that the 230P scaffold had biomineralization. Figure 5. SEM and EDAX for 215P scaffolds. The picture on the left shows an SEM picture of biomineralization on the 215P scaffold at 28 days. The EDAX confirms the presence of calcium phosphate. The confocal shows that there is decreased biomineralization as compared to that of the 230P scaffold. SEM images and EDAX were used to quantify the amount of biomineralization between the two printers. It was shown that the 230P scaffolds had more biomineralization than the 215P scaffolds (Figure 4 & Figure 5). Figure 6. SEM images of 3-D prints and spuncast. A) shows the 3-D printed scaffold at 5000 times magnification. The picture shows the microscale and nanoscale patterns formed. B) shows the spuncast scaffold at 5000 times magnification. The spuncast scaffolds had almost flat surface whereas 3-D prints had roughness. The 3-D printed surface was shown to contain the most visible micropattern. The control spuncast pattern did not show an apparent micropattern or nanopattern (Figure 6). This was expected as spuncast patterns are meant to be perfectly flat. Figure 7. Fluorescent image of 24 hours after plating cells on 3-D prints and spuncast. The above pictures show the cell attachment 24 hours after initial plating on 3-D printed scaffold (A) and spuncast scaffold (B). This shows similar levels of cell attachment for both scaffolds. Figure 8. Fluorescent images of 3-D prints on day 7. A) It was shown that the nodule formation of the 3-D printed scaffold at day 7. B) The picture shows the nodule formation on the 3-D printed scaffold with dexamethasone at day 7. C) The picture shows the proliferation increase due to shaking stimulus at day 7. When induced with dexamethasone, there was more differentiation (thicker nodules) and shaking stimulus increased proliferation and the spread of the cells. There is a clear network formed between DPSCs. Figure 9. Fluorescent images of the spuncast scaffold on day 7. A) This picture shows the nodule formation of the spuncast scaffold on day 7. B) This picture shows the nodule formation on the spuncast scaffold treated with dexamethasone on day 7. C) This picture shows the proliferation increase due to shaking stimulus on day 7. Once again, differentiation was greater in dexamethasone-induced media and proliferation was greater for shaken samples. DPSC plated on the two scaffolds (3-D printed and spuncast) yielded similar levels of cell attachment (Figure 7). DPSCs plated on scaffolds without dexamethasone or shake stimulus quickly began to form nodules (Figure 8). The DPSCs plated on the 3-D printed scaffolds that were treated with dexamethasone showed greater nodule formation than those of the 3-D printed scaffolds that were not treated with dexamethasone. This was expected because dexamethasone is known to induce formation of nodules and differentiation[7,9]. Spuncast samples without dexamethasone treatment had almost no nodule formation or indication of differentiation (Figure 8). However with the addition of dexamethasone to the media, the spuncast scaffold saw immediate nodule formation (Figure 8). All cell cultures treated with the rocking shaker had an increase in the rate of proliferation regardless of the presence of dexamethasone (Figure 9). Figure 10. Confocal images of 3-D prints (flats) and spuncast. This figure shows confocal images of biomineralization for the spuncast and 3-D printed scaffolds. A) Confocal of 3-D printed scaffolds without dexamethasone shows biomineralization spread throughout the scaffold. B) These samples, which were treated with dexamethasone, showed higher amounts of biomineralization throughout the scaffold, as compared to 11A. C) Spuncast without dexamethasone had minimal biomineralization and D) spuncast with dexamethasone had very small amounts of biomineralization. E) 3-D prints treated with shaking stimulus had small amounts of dense biomineralization. F) 3-D printed scaffolds treated with shaking stimulus and dexamethasone showed the largest amount of calcification spread throughout the scaffold. G) Spuncast with shaking stimulus shows very minimal amounts of calcification and H) Spuncast with shaking stimulus and dexamethasone treatment showed a slight increase in calcification in comparison to G. Overall, shaking increased proliferation and differentiation levels. The 3-D printed scaffolds had an increase in biomineralization in comparison to spuncast scaffolds when plated with DPSCs without any treatment. When treated with dexamethasone, both scaffolds had an increase in biomineralization, but 3-D printed scaffolds had higher calcification levels. When induced with shaking, both scaffolds had an increase in proliferation and slight increase in differentiation. 3-D printed structures once against had a greater change than spuncast scaffolds. Highest levels of calcification were obtained through dexamethasone treatment with shaking on the 3-D printed scaffolds (Figure 10). Figure 11. ALP and RUNX2 RT-PCR graph of relative mRNA levels. This figure shows the early markers for osteogenic differentiation, alkaline phosphatase (ALP) and runt-related transcription factor 2 (RUNX2). Flat signifies the 3-D printed scaffold whereas SC signifies the spuncast scaffold. A) ALP mRNA data indicates that all 3-D printed scaffolds had significant increases with the exception of the scaffolds treated with both dexamethasone and shake incubation. B) RUNX2 mRNA levels show that all 3-D printed scaffolds had significant increases with the exception of the scaffolds treated with both dexamethasone and shake incubation. Figure 12. OCN and COL1 a1 RT-PCR graph on relative mRNA levels. This figure shows the late markers for osteogenic differentiation, osteocalcin (OCN) and collagen type 1 alpha 1 (COL1 a1). Flat signifies the 3-D printed scaffold whereas SC signifies the spuncast scaffold. A) It was shown that across the board mRNA levels for OCN are low. All 3-D printed scaffolds show significant increases over their spuncast scaffold counterparts with the one exception of the no treatment scaffolds. B) It was shown that for COL1 a1 the mRNA levels show significant increases for all 3-D printed scaffolds as compared to their spuncast counterparts with the exception of the scaffolds treated with both dexamethasone and shake incubation. After 39 days of cell growth, RT-PCR was done to check for two proteins that indicate early stages of osteogenic differentiation, ALP and RUNX2. ALP expression was the greatest for 3-D printed scaffolds treated with dexamethasone (3-D print without dexamethasone was second highest). The spuncast scaffolds all showed lesser levels of expression for ALP as compared to 3-D prints as a whole (Figure 11A). The results were similar for RUNX2 (Figure 11B). The 3-D printed scaffolds in general have higher expression than that of the spuncast scaffolds. Interestingly enough, the mRNA level for ALP for 3-D printed scaffolds not treated by dexamethasone or shaking was not statistically different from the amount of expression for the spuncast scaffold treated with dexamethasone and shaking (Figure 11A). For OCN (osteocalcin), expression was relatively low for all treatments, with the exception of the 3-D printed scaffold treated with shaking and the 3-D printed scaffolds treated with dexamethasone and shaking (Figure 12A). However, this still indicates that 3-D printed scaffolds show more osteogenic differentiation than spuncast samples. COL1 a1 is the last protein checked for and these results are in line with the ALP and RUNX2 data. 3-D printed scaffolds have more gene expression for COL1 a1 than spuncast samples across the board (Figure 12B). The SEM images of the scaffolds created by different 3-D printers confirm the hypothesis that they would create different surface topographies. Structures created from 215P had unfused PLA filaments (holes) whereas the ones created by 230P were well-fused. This was because the extrusion temperature of 215P (215oC) was not high enough to properly merge the filaments together. The fluorescent microscope images indicated that there was greater proliferation and nodule formation on 230P. EDAX and confocal microscopy analysis further confirmed this finding by showing higher levels of biomineralization on the surface of the scaffold made from 230P. These differences suggest that production of 3-D prints is not reproducible when comparing 3-D printer models. Since it was found that 230P scaffolds had higher levels of differentiation, this printer was used for comparison of 3-D prints to spuncast samples. DPSCs that were grown on the rough surfaces (micropatterns and nanopatterns) of the 3-D printed scaffolds, as hypothesized, displayed more biomineralization compared to spuncast scaffolds. The fluorescence microscopy shows that there were stronger levels of cell adhesion on the spuncast samples in comparison to the 3-D printed scaffolds. This implies that the micropatterns and nanopatterns present on the 3-D printed scaffolds decrease cell adhesion. Without any additional treatment, only the 3-D printed scaffold showed nodule formation, an early sign of differentiation. This indicates that the surface pattern present on 3-D printed scaffolds have the potential to naturally trigger osteogenic differentiation without the addition of any treatment. This is in line with previous research that suggests that DPSCs are viable to osteogenically differentiate using chemical stimulus on 3-D scaffolds.29 This study is unique in studying the osteogenic differentiation of DPSCs on 3-D printed scaffolds without chemical stimulus. With the addition of physical stimulus, in the form of shake incubation, the DPSCs were found to proliferate at a heightened rate. This could imply that natural factors, such as cytokines, are inhibiting proliferation. The shake stimulus could cause the cytokines to move more freely, resulting in a greater rate of proliferation. Our results therefore suggest that 3-D printed structures are a cost-effective and more efficient alternative to molded scaffolds for dental implants. Furthermore, despite greater capabilities, 3-D printers are not “substantially equivalent” to impression molding. There were clear indications that differentiation and cell attachment rates differed between spuncast and 3-D printed scaffolds. Therefore, 510(k) approval should not be granted to the use of 3-D printers for implanting. However, because it was found that 3-D printers have the potential to be a better alternative, it should be submitted for formal FDA-approval in the field of regenerative medicine. This project demonstrated the ability for surface topography to be able to affect the differentiation and proliferation of DPSCs. This also indicated that physical stimulus such as shaking increases the proliferation rate further. The increased nodule formation of the 3-D printed scaffolds confirmed the high level of differentiation, supported with SEM pictures of calcification and RT-PCR of the osteogenic genes. The hypothesis that roughness of the 3-D printed scaffolds would increase the differentiation capabilities of the scaffold was supported. Moreover, it was also shown that molded and 3-D printed scaffolds are not equivalent in terms of surface topography or cell proliferation and differentiation. Therefore, 510(k) should not be provided for 3-D printed scaffolds. With the addition of chemical stimuli such as dexamethasone, nodule formation was consistently spread throughout both the spuncast and 3-D printed scaffolds. Samples prepared with dexamethasone showed high levels of osteogenic markers on RT-PCR analysis, confirming previous research on the ability of dexamethasone to regulate differentiation of DPSCs. This was confirmation of the validity of experimentation, as the positive control showed results meeting expectations in previous literature. Similar to this, spuncast samples without any treatment showed no nodule formation. This was expected as spuncast samples are completely flat and have no surface topography to activate nodule formation. This control further validated experimentation, supporting the idea that nanoscale and microscale roughness on 3-D printed scaffolds affect the proliferation and differentiation of DPSCs. Future experiments could examine the effect of only nanopatterns on DPSC proliferation and differentiation. Studies have shown that polystyrene and poly(methyl methacrylate) form uniform nanostructures through phase separation. This could be utilized to create a surface with strictly nano-sized patterns. This would allow for more controlled study of the effect of surface topography on DPSCs. Further studies also need to be conducted on the cell lines used within this experiment because the sample culture came from an anonymous donor. It is necessary to study different cell lines of DPSCs because other cell lines could produce different results. Another experiment could look into other 3-D printed surface designs and the effects they have. Yet another study could also look at replacing fetal bovine serum with a human serum that can remove the possibility of the transferring of disease from animals to humans. These new experiments would enhance the understanding of not only DPSCs, but also the use of 3-D printers in medical applications. Graziano, A., d’Aquino, R., Papaccio, G., & Laino, G. (2008). Dental pulp stem cells: a promising tool for bone regeneration. Stem cell reviews, 4(1), 21­26. Laino, L., d’Aquino, R., De Rosa, A., Lanza, V., Tirino, V., Graziano, A., ... & Papaccio, G. (2009). Human mandible bone defect repair by the grafting of dental pulp stem/progenitor cells and collagen sponge biocomplexes. Eur Cell Mater, 18, 75­83. Alliot-Licht, B., Bluteau, G., Magne, D., Lopez-Cazaux, S., Lieubeau, B., Daculsi, G., Guicheux, J. (2005). Dexamethasone stimulates differentiation of odontoblast-like cells in human dental pulp cultures. Cells and tissue research, 321(3), 391-400. Grottkau, B. E., Purudappa, P. P., & Lin, Y. F. (2010). Multilineage differentiation of dental pulp stem cells from green fluorescent protein transgenic mice. International journal of oral science , 2(1), 21. Gronthos, S., Mankani, M., Brahim, J., Robey, P. G., & Shi, S. (2000). Postnatal human dental pulp stem cells (DPSCs) in vitro and in vivo. Proceedings of the National Academy of Sciences, 97(25), 13625-13630. Serra, T., Planell, J. A., & Navarro, M. (2013). High-resolution PLA-based composite scaffolds via 3-D printing technology. Acta biomaterialia, 9(3), 5521-5530. Xiao, L., Wang, B., Yang, G., & Gauthier, M. (2012). Poly (lactic acid)-based biomaterials: synthesis, modification and applications (pp. 247-282). INTECH Open Access Publisher. Serra, T., Mateos-Timoneda, M. A., Planell, J. A., & Navarro, M. (2013). 3D printed PLA-based scaffolds: a versatile tool in regenerative medicine. Organogenesis, 9(4), 239-244. Snyder, G. H., Cotteleer, M. J., & Kotek, B. (2014, April 28). Additive manufacturing in medical technology: Additive manufacturing comes to life [Press release]. Lim, K. T., Im, A. L., Cho, C. S., Jeon, S. H., & Chung, J. H. (2010). Novel composite scaffolds for tooth regeneration using human dental pulp stem cells. Korean Tissue Engineering and Regeneration, 7(5), 473-480. Yang, S., Leong, K. F., Du, Z., & Chua, C. K. (2002). The design of scaffolds for use in tissue engineering. Part II. Rapid prototyping techniques. Tissue engineering, 8(1), 1-11. Ventola, C. L. (2014). Medical applications for 3D Printing: current and projected uses. Pharmacy and Therapeutics, 39(10), 704. "U.S. Food and Drug Administration." Device Approvals, Denials and Clearances. N.p., n.d. Web. 17 Aug. 2015. Prestwich, G. D. (2007). Simplifying the extracellular matrix for 3‐D cell culture and tissue engineering: A pragmatic approach. Journal of cellular biochemistry, 101(6), 1370-1383. Kim, D., Kim, J., Hyun, H., Kim, K., & Roh, S. (2014). A nanoscale ridge/groove pattern arrayed surface enhances adipogenic differentiation of human supernumerary tooth-derived dental pulp stem cells in vitro. Archives of oral biology, 59(8), 765-774. Deng, Y., Liu, X., Xu, A., Wang, L., Luo, Z., Zheng, Y., ... & Wei, S. (2015). Effect of surface roughness on osteogenesis in vitro and osseointegration in vivo of carbon fiber-reinforced polyetheretherketone–nanohydroxyapatite composite. International journal of nanomedicine, 10, 1425. Kolind, K., Kraft, D., Bøggild, T., Duch, M., Lovmand, J., Pedersen, F. S., & Besenbacher, F. (2014). Control of proliferation and osteogenic differentiation of human dental pulp derived stem cells by distinct surface structures. Acta biomaterialia , 10(2), 641-650. Chang, C., Bherwani, A., Simon, M., Rafailovich, M., & Jurukovski, V. (2014). Entangled Polymer Surface Confinement, an Alternative Method to Control Stem Cell Differentiation in the Absence of Chemical Mediators. Ann J Materials Sci Eng, 1(3), 7. Mendes, G. C., Brandao, T. R., & Silva, C. L. (2007). Ethylene oxide sterilization of medical devices: a review. American journal of infection control,35(9), 574-581. Thomas, R. Z., Ruben, J. L., Jaap, J., & Huysmans, M. C. D. (2007). Effect of ethylene oxide sterilization on enamel and dentin demineralization in vitro. Journal of dentistry, 35(7), 547-551. Kuo, Y. C., & Yeh, C. F. (2011). Effect of surface-modified collagen on the adhesion, biocompatibility and differentiation of bone marrow stromal cells in poly (lactide-co-glycolide)/chitosan scaffolds. Colloids and Surfaces B: Biointerfaces, 82(2), 624-631. Kern, W. (1990). The evolution of silicon wafer cleaning technology. Journal of the Electrochemical Society, 137(6), 1887­1892. Ma, H. L., Hung, S. C., Lin, S. Y., Chen, Y. L., & Lo, W. H. (2003). Chondrogenesis of human mesenchymal stem cells encapsulated in alginate beads. Journal of Biomedical Materials Research Part A, 64(2), 273-281. Wang, Y. H., Liu, Y., Maye, P., & Rowe, D. W. (2006). Examination of mineralized nodule formation in living osteoblastic cultures using fluorescent dyes. Biotechnology progress, 22(6), 1697-1701. Pawley, J. (2010). Handbook of biological confocal microscopy. Springer. Granéli, C., Thorfve, A., Ruetschi, U., Brisby, H., Thomsen, P., Lindahl, A., & Karlsson, C. (2014). Novel markers of osteogenic and adipogenic differentiation of human bone marrow stromal cells identified using a quantitative proteomics approach. Stem cell research, 12(1), 153-165. Lee, K. S., Kim, H. J., Li, Q. L., Chi, X. Z., Ueta, C., Komori, T., ... & Bae, S. C. (2000). Runx2 is a common target of transforming growth factor β1 and bone morphogenetic protein 2, and cooperation between Runx2 and Smad5 induces osteoblast-specific gene expression in the pluripotent mesenchymal precursor cell line C2C12. Molecular and cellular biology, 20(23), 8783-8792. Lau, E. M. C., Choy, D. T. K., Li, M., Woo, J., Chung, T., & Sham, A. (2004). The relationship between COLI A1 polymorphisms (Sp 1) and COLI A2 polymorphisms (Eco R1 and Puv II) with bone mineral density in Chinese men and women. Calcified tissue international, 75(2), 133-137. Khanna-Jain, R., Mannerström, B., Vuorinen, A., Sándor, G. K., Suuronen, R., & Miettinen, S. (2012). Osteogenic differentiation of human dental pulp stem cells on β-tricalcium phosphate/poly (l-lactic acid/caprolactone) three-dimensional scaffolds. Journal of tissue engineering, 3(1), 2041731412467998.